There are a lot of products nowadays that make life easy for e-commerce entrepreneurs. You’ve got companies like Shopify that make it easy to set up your store, and companies like Oberlo that make it easy to add products to your store. Chatbots are another tool you can add to the mix to make it easier to get sales. Let’s take shopping for sneakers as an example. What’s the current buying experience like? You go to a website you like – maybe you heard about it from a friend or found it through an intriguing Facebook promotion. Once you’re there, you find the shoe section, you filter by style, size and color, and then you’re presented with a list of options. You compare a bunch or them and then you add a few to your cart so you can come back later. Maybe you will, maybe you won’t, although the research says that you probably won’t. Now maybe you’ll get hit with a retargeted ad or see an advertisement on the way to work the following week and return to your abandoned cart to follow through with the purchase. But what if you received a friendly reminder right on your phone? What if this reminder was personal, human even? What if this message came through the same channel that you use to catch up with your friends and family throughout your hectic life of e-mails and meetings, not to mention those telemarketers ignoring the fact that you’re on the Do Not Call list? Do you think that might make it more compelling? Do you think your subconscious might connect better with that feeling of familiarity and individualism? They’ll send you tracking updates, process returns, and keep you up to date with the latest promotions, all customized to your taste. 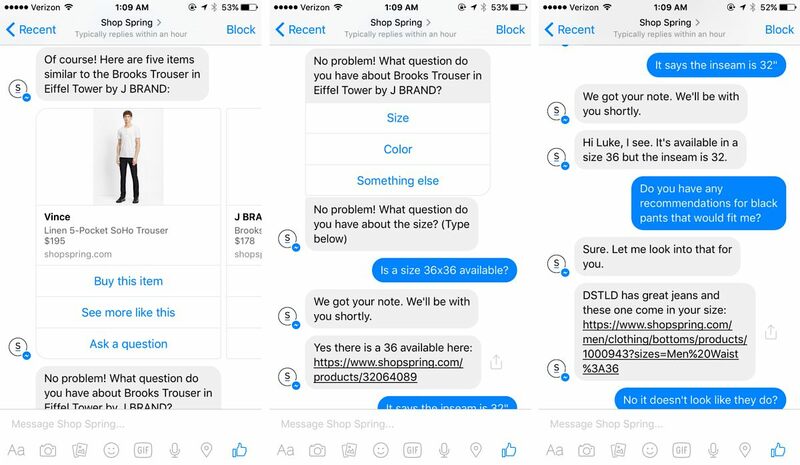 If done properly, Facebook Chatbots provide enormous potential (a connection to 900 million people on FB Messenger) to drive sales and enhance the customer relationship. But these bots are new and foreign to most of us and aren’t superhuman (we’ll debate whether a computer can be superhuman later, okay?). But if you aren’t careful, using a chatbot may backfire. You could annoy or confuse a customer, provide bad information or make it difficult to complete a purchase. A frustrated customer not only won’t buy, but they’re likely to suggest that others steer clear of your brand as well. But it’s definitely worth figuring out how to leverage these chat apps. 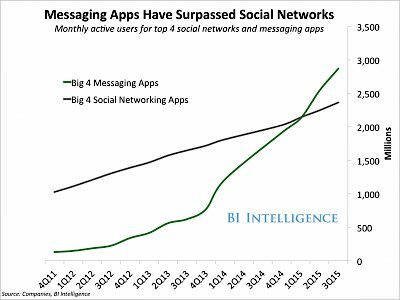 Although social media will likely beat out search soon enough, it looks like chat apps might beat it to the punch. 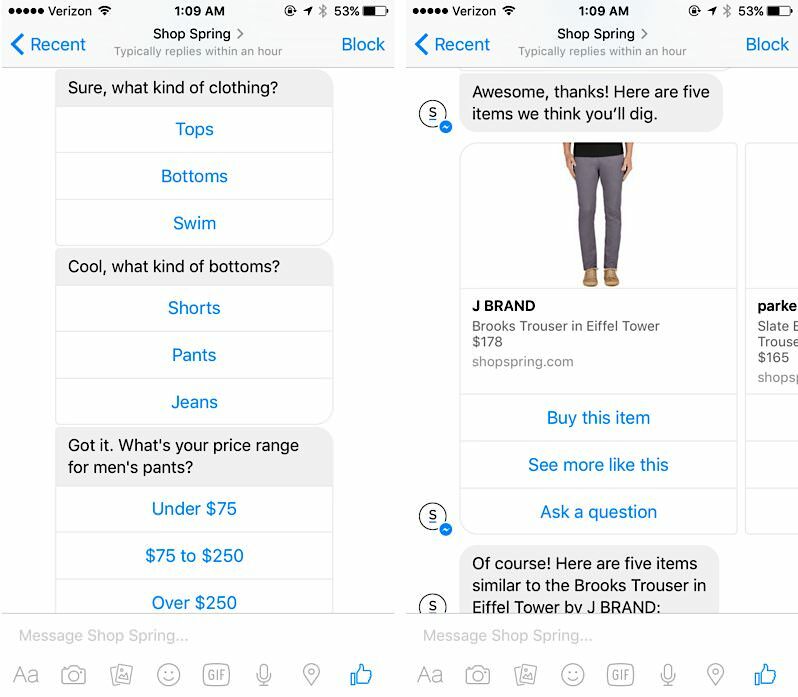 Let’s look at a few ways that e-commerce businesses are using chatbots to grow their business as well as some important tips for building the most effective bots you can. The best thing about chatbots is that they give you an automated, cost-effective way to communicate with your customers in a way that is more direct and personal than ever before. It’s something you can easily add to your Facebook marketing strategy. There are a few ways to use your chatbot to help with customer service. For starters, you can use it to field FAQs and provide simple answers. You can also use it to collect some basic information like e-mail, order number and description of the problem before passing it along to one of your support reps to take over. It’s important to remember that this technology isn’t state of the art yet. 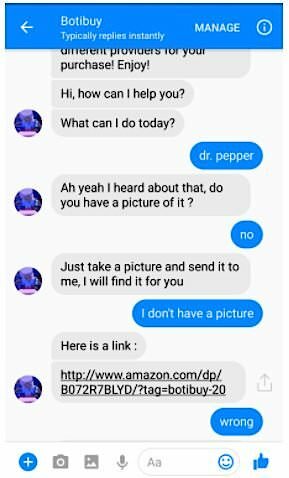 You can’t expect your bot to handle any complicated or unique requests, so it’s essential that whenever you use bots you should have human support on standby to help answer any such questions. 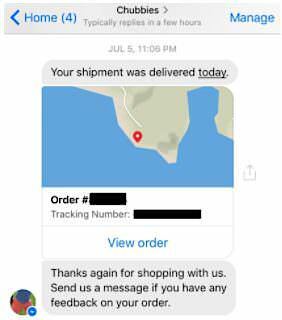 You can also offer your customers an opportunity to use Messenger to handle order and shipping confirmations. Send out tracking numbers, order updates and solicit feedback all from a single message thread. 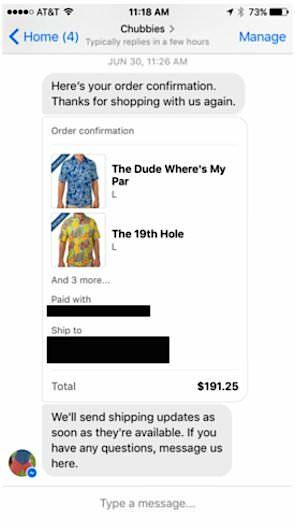 One way to really boost sales is to make it easy to reorder via Messenger. If the bot has a customer’s order history, you can offer options to browse and reorder straight from their phone or browser. While improving the buying experience will certainly increase sales in the long run, you can also promote new products and offers directly to your customers via Messenger. You already know their buying habits and their demographic information. You’ve established a line of communication. Now you can use this platform to remind customers of products they might want to check out or new promotions you have coming up which might interest them. Do not be too pushy or annoy customers. Unless they opt in for it, you shouldn’t be blasting them with the latest promotions every weekend – just the promos and offers that are catered specifically to their interests and purchase history. These messages can be very invasive to a customer as they’re going directly to their personal phones and computers in a way that mimics the conversational experience they have when chatting up a friend or a cute girl they met last Friday. The occasional, useful promotion will be welcome by most– but salesy spam will not. Your bot serves at the pleasure of the customer. If you annoy them, not only will the communication line be severed, but it’ll leave a bad taste in the customers’ mouth, too. However, keep in mind that these bots are still pretty basic. If you sell products like apparel with multiple options (size, color, style, etc. ), it might be easier to direct your customers to browse your site in order to provide a better experience. If not, you’ll definitely want to have a human on deck to help pitch in, as you can see from the example above. But if you sell a few straightforward products or wish to facilitate re-orders and add-on sales, this does provide an exciting opportunity. It’s important to keep in mind that no matter how cool and exciting these new bots are, they are still in the early stages and customers might not be used to interacting with them. Here are a few tips to help make the experience a good one. You can have some fun with greetings and witty jokes, but when it comes to the core functionality of your chatbot, make sure it’s easy to understand. The user should get a simple answer or solution and know what they need to do to move forward. Don’t leave them guessing as to what they need to say. You may have heard that NLP technology is helping computers understand complex sentences and formulate intelligent responses. While that’s true, your basic chatbot isn’t going to be equipped with the fanciest technology on the market. You can solve this by using simple, clear language and prompting the user with options to respond. This maintains the flow and dynamic of the conversation without forcing customers to worry about formatting their answer properly. Leaving questions open ended is likely to create a frustrating experience for shoppers. It forces them to guess what to say and increases the chance that they won’t have a coherent experience, thereby increasing the odds that they will leave before accomplishing their goal. I’ll say this again – your chatbots serve at the pleasure of your customer. Before you can start chatting with anyone, they must approve and initiate contact. Users can also easily block your bot if it’s annoying them. Facebook does this to protect the platform from becoming the next generation of spam and maintain its status as the most popular chat app on earth. It’s probably best to start by using your app to help improve your customers’ experience first by making it easier to manage returns, orders and customer service. Then slowly introduce promotions or selling opportunities. Monitor your customers’ reaction closely to make sure you’re not annoying anyone. Know who you’re building this bot for and what problem you’re trying to solve. Think about your customers right now and solicit their thoughts. What part of the buying experience has the most friction? Where are they dropping off? What steps are costing you the most money or causing the most headaches? Build a chatbot to solve those problems. One at a time. While it’s fine to get excited about this new technology, don’t expect to have robots fully servicing your customers like a Star Wars droid just yet (you’ve seen 2001: A Space Odyssey, right?). Most chatbots are still programmed to respond to simple commands. And the last thing you want to do is leave your customer frustrated with an unresolved issue. Instead of making things easier and quicker for them, you’ll only infuriate them before they call you angrily, decide not to buy and/or leave a scathing review on all your social media. This tip is especially important for Customer Service bots. Customers should always know that they can reach out to a real person for help. It’s a good idea to let them know how (like typing a certain command or calling your support line) in the beginning. If you’re suggesting solutions to a problem, you may also want to offer a preset option like “Contact Support” in case their questions remain unanswered. If you have the size and budget for it, it may even pay to have someone supervise the conversations in real time and jump in whenever things look messy. Even though you need staff on standby, you’ll still benefit greatly from having bots handle the common and easy problems that would normally be repetitive and a waste of time. They can also do the legwork by collecting all the necessary information from your customer while she waits for your agent to connect. As with any new technology or marketing strategy, you’ll benefit from continued testing and improvement. Watch how your customers respond to new ideas and see which steps trip them up. You won’t build the perfect system on your first try, but if you pay attention and aim to improve it each quarter, you’ll get more and more out of it. Watch technology trends and as this technology improves, you’ll be able to grow and do more with it. You’ll be lightyears ahead of the competition who wait until the next big press buzz to start. There are many services out there that will help you set up Facebook Messenger Chatbots. In the beginning, you’ll probably want to use a platform like Chatfuel, OnSequel or Botsify. For a simple do-it-yourself guide to creating a chatbot, Social Media Examiner has a great post. Start by building a bot with a single goal like handling order confirmations or navigating your FAQ. Watch how your customers use it and refine it based on their feedback. Then slowly start adding features to help more customers and start actually driving new sales. As a bonus, the early users will be excited to grow with your brand as they see their online shopping companion evolve based on their specific feedback. While you could code these bots from scratch or hire a developer to build them for you (the same companies mentioned above offer custom development services), it’s really not necessary and probably a waste of money until you have a better idea of exactly how your customers are responding to it. While we’re at least a few years (and it really might be just a few years) from building our own android assistant like C3PO, chatbots are already starting to help businesses mimic human conversations to enhance their relationships with customers. That’s why Amazon and Apple both announced that they are focusing on machine learning technology in 2017 and why Shopify includes Messenger as an official sales channel. 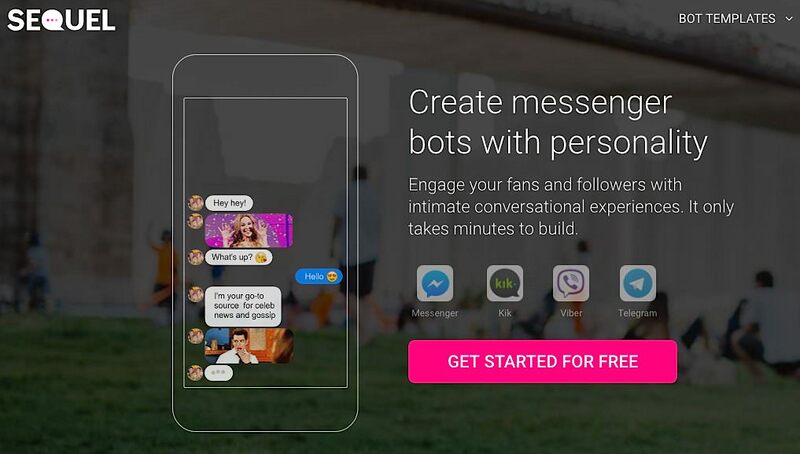 Facebook Messenger chatbots are easy enough to set up on your own, so why wait to try it out?